I started going to Fivex3 about 7 months ago and was immediately impressed. My main focus has been the strength training classes which are very challenging and addicting. Once I got my form down (I had no idea how much work my form needed until I started here), I was able to steadily increase my max weight for all my lifts. Emily and Diego are extremely knowledgeable in all areas of fitness and they work very closely with each person in the class to improve their form and manage their goals. All of the members are very friendly and work together to help and encourage each other. It’s a very fun and challenging place that I would recommend to anyone who is serious about getting in shape and doing it the right way. I have had a great experience working with Emily and Diego at Fivex3. I learned about Starting Strength before coming to them and immediately liked its focus and simplicity — essential compound movements done three times a week. I tried to learn the movements on my own, made some progress, and figured I could be successful by watching YouYube videos and reading internet forums (like everyone else does, right?). But meaningful progress only came when I started working with Emily and Diego. They provide a supportive but challenging environment, and a place where you can learn to lift with proper technique. The squats and deadlifts we do in the strength class are not like treadmills and machines you can use without much thought or training (particularly if you are, like me in your thirties and out of shape). But strength class is way more fun and rewarding. And I’ve also met a lot of great people there. Emily and the All Strength Class made me healthier, stronger, and looking drastically better (after only a few months). In college I lifted weights and worked out with guys from the wrestling team during their offseason. I learned lots of routines and programs, many of them somewhat complex. I got strong but not dramatically strong. Mostly I just got good at the exercises – many of them isolation exercises. But looking back, I realize I probably wasted a lot of time. I was spending hours in the gym each day without a real big impact. Fast forward a decade + and I was out of shape and unhealthy. Life happened – kids, work, travel for work, and even a major surgery. There wasn’t time to spend hours in the gym any longer. I had picked up a gut – I was an unhealthy thin guy with a gut. I started running. It worked for a short while. It trimmed my gut, but left me with knee and foot injuries. It wasn’t a sustainable solution. I moved to P90X and did that 4 times through but somehow it seemed that the routine wore my body out and left me sick, tired, and drained, and again it was taking a lot of time. Finally, I turned back to the weights, but kept hurting myself – hip, and shoulder injuries. I chalked it up to aging. In looking for help with weight training, I found Emily, 5×3, and the All-Strength-Class. The class is amazing. The exercises are straight-forward, but very impactful, and more importantly, done right with Emily’s guidance. Now, I lift more than I did in college. I look different, and without even trying, my bodyfat percent dropped and the injuries are gone (knock-on-wood). It’s been so busy in your studio the last few times I’ve been there (hurray for you!) that I haven’t had a chance to tell you that in the last month I’ve noticed a distinct change in everything about my physical self. I feel (and in my opinion look) better than I have since before Lucy was born. I feel stronger and more confident. I am certain this has to do with exercising with you. I am a dancer, and most people consider me to be in shape. But dancers develop some very specific muscles, and there are so many things that we become accustomed to doing that is very unbalanced. I have learned so much from taking strength training with Emily — finding and using muscles that were weak, finding new ways to adjust my posture or new ways to think about being mobile. Aside from that, I always feel great — accomplished — leaving class. I feel my strength improving and both Emily and her husband Diego are so helpful and encouraging. To say I love Basic Training and the All Strength class is an understatement. Every time I leave either class I feel awesome…like I can take on the world! 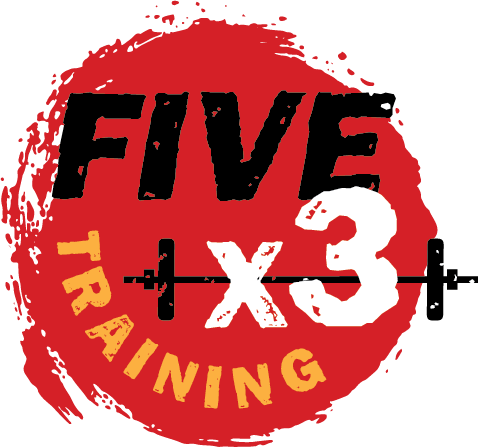 So glad you opened Fivex3 and that I’m lucky enough to have met you and can train with you. You’re the best!! I just wanted to let you know that I’m still at it twice a week – the warm up, planks & 4 basic exercises. I’ve recruited a few women on my street who work out with me occasionally. I feel great. I’m definitely stronger, and my clothes are loose (I bought a pair of 00 jeans a couple weeks ago!). I really do feel stronger and more energized. I feel like I found a program that really works for me and I have you to thank. It’s great to feel motivated for a change. In the past, I never really saw results from my minimal workouts (go figure), and I’m not one of those people who goes to the gym 5 days a week, so I was never particularly motivated to work out. It’s awesome that I can get away with going twice a week for 30 – 40 minutes as long as I watch what I eat (that has been a huge change for me). I try to get lots of protein, esp. in morning and limit carbs! Emily’s Basic Training class is my favorite exercise class, and I’ve learned a lot about technique and movement. I’ve never thought that I would one day love to exercise so much, but she changed my mind dramatically. The very first class was a disaster, but Emily made me believe that I could make it. During the first class, I had to make an excuse to take a break. I could not even hold a plank correctly. However, Emily encouraged me and corrected my posture patiently. Her warm smile and friendly attitude helped me to outperform myself. Over the past few months, I’ve gained so much strength and gotten so much more fit overall. I have increased my single arm press from 5 pounds to 20 pounds and increased my goblet squat from 10 pounds to 40 pounds! I couldn’t even believe that I could do that. I used to think numbers didn’t mean much, but I was wrong. The number does mean something, better strength and better performance. The stronger a person is, the better their performance in their daily life. The class revived my life. Every day, I am glad that my aunt and uncle (whom also benefit from the class) introduced me to such a wonderful class. I would recommend this class to everyone who wants to do better in life or is looking for something to do to de-stress after work. After the workout, all those sore spots from work disappear, tight muscle release, and I feel ready for work the next day. I love this class, and I hope more people can share this joy with me. Wow! Emily, as you know, I came with Candice because she was talking about how good you were. Besides, we had been putting off exercising for quite some time. Now that we come I FEEL GREAT!!!!!! There is no other way to put it. As you know, my left side is my problem, but with you, I can feel it getting stronger. It is a constant battle for me, but with you there giving me that confidence to push forward, I am always pleased with the end result. I’m no longer always tired and I do have a little more energy. Thanks Emily. I enjoy my Mondays and Wednesdays with you. I have only been training with you for several months. What a difference between a male and female trainer! Your education, experience, methods, and techniques clearly demonstrate that you understand the uniqueness of the female body. The sessions are demanding, and carefully planned and result in a complete workout. You use no exercise machines during our sessions, so I can use your techniques at home. You have taught me that fidelity to form is essential to mastering the technique of an exercise. I have noticed a huge difference in my body and have a better understanding of why our sessions are important to my everyday life. You are professional, dedicated, thoughtful and seriously committed to being a personal trainer. I look forward to feeling better, looking better and learning more! Emily has helped me lose weight, get toned and achieved the best physical fitness I’ve had in my life – in my forties! I would still be wearing sweat pants and my maternity pants if it weren’t for Emily! I am 6 months post-partum with my second child and have been training with Emily for the past 4 months. I wanted to get back the body I had before I was pregnant with baby #1 (4 years ago) but I didn’t know how. Emily got me started on a program and I can hardly believe that my body is actually looking better than it did before I was even pregnant with my first child. I AM NOT KIDDING! The strength training combined with a healthy diet has brought on unbelievable changes in my body and boosted my self image. From the pregnancies to breastfeeding to picking up little ones to playing on the floor I have been stooping over for years which has caused a roundness in my shoulders and back. I have become very self conscious about my posture. With the back strengthening work I have done with Emily I have actually improved my posture which has done wonders for my self esteem. Seeing my mid section getting smaller week after week also gives me a huge boost and makes me work all the harder in my sessions. I can’t believe that I will be wearing clothes this summer that I have had packed away for 4 1/2 years!!! Thank you Emily!! Jair and I have been taking class since June 2009. At age 50+, it was quite a challenge for such a demanding class. In the beginning, I couldn’t even go through the whole class without walking out for a 10 minutes break. After few classes, I was debating if I should just drop off. But, I did not. Now I am so glad that we both stuck to the class and enjoy the new healthy life style. We starts to notice a difference both mentally and physically after only two sessions. My knee pain had been troubling me for years especially during cold wet weather. Now, the pain is totally gone because the surrounding muscle is stronger so the joint carries less load. Our endurance, strength and flexibility are all significantly improved. Our life style is much more active than before. Now we do kayaking, snorkeling, hiking, and traveling around. We are much healthier and happier than used to be. What make this class stands out is that it is low impact, self-paced and highly effective. As the instructor is always saying – “It’s all about the form not quantity.” Therefore the individual student can choose the speed which best suits his/her physical condition without competition. In addition, all exercises and movements are well organized and designed. It’s truly a total body workout. Now, our twice a week classes have blended into our life style. It is our most important weekly exercises that leads us to enjoy a happy and healthy life. You are just the most amazing instructor. When I win the lottery I am definitely hiring you as my personal trainer. I have never felt so nurtured before in a fitness class. Thanks again for who you are and gently helping me push myself. This is my second year taking the class and I absolutely love it! I am a lot stronger than when I started. I can definitely feel the improvement in my body’s strength and stamina, both during class, as well as during my usual daily activities. As someone who took ballet for many years, I appreciate your knowledge of the body and proper form/ body placement. Your teaching style and personality are so positive and motivational. I like how you tailor/modify the exercises to different levels of ability, give individualized comments and feedback, and offer plenty of encouragement. A refreshing, yet challenging class for all ages and levels. I have taken this class pre-, during, and post-pregnancy and, with Emily’s help, have found modifications to each exercise that still maintain the integrity of the exercise, but met my physical limitations. I love Emily’s personal style and attention that she gives to every member of the class. She is able to meet participants at their skill level, while still providing motivation and tips on proper form. You are enthusiastic, accepting, respectful and a leader – in other words, you are a wonderful teacher. I was going to Emily’s cycle class in one of the chain clubs which had more than 12 instructors for cycling and Emily was the best among them and here is why: She was very professional, and alway asked if anybody needed help for bike set up, her classes had a good variety and she always had eye contact to make sure everybody was in sync with her, and everyone can do what she’s telling them, never shouting, never screaming, and using very good music to make a perfect combinations. Excellent work-out and I miss her classes.